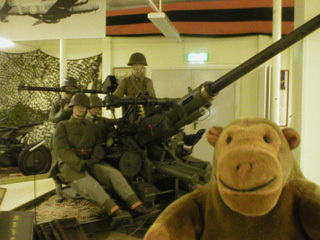 "There's enough here to see off any number of owls"
After looking at a room full of modern anti-aircraft missiles, and some radios, and sports awards, and a bit of barracks, Mr Monkey found a room full of light anti-aircraft guns from WW2. 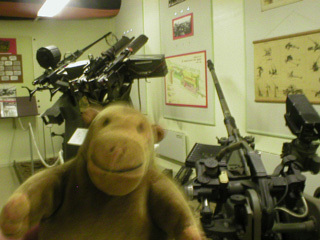 Lots of them were arranged around the sides of the room, and there was a Bofors m/39 40mm gun in the middle of the room. Quick firing Bofors guns were exported to, or made under license by, almost everyone in the world who thought they might need to shoot at aircraft. Mr Monkey wondered for a moment why all the shells in the magazines were bright yellow, then scampered out of the building.